Looking for a treat to satisfy your sweet tooth? Don’t let their small size fool you! These rich and gooey black bean brownie bites are filled with flavor and nutrition. Good things do come in small packages! Happy Birthday Recipe Redux!! 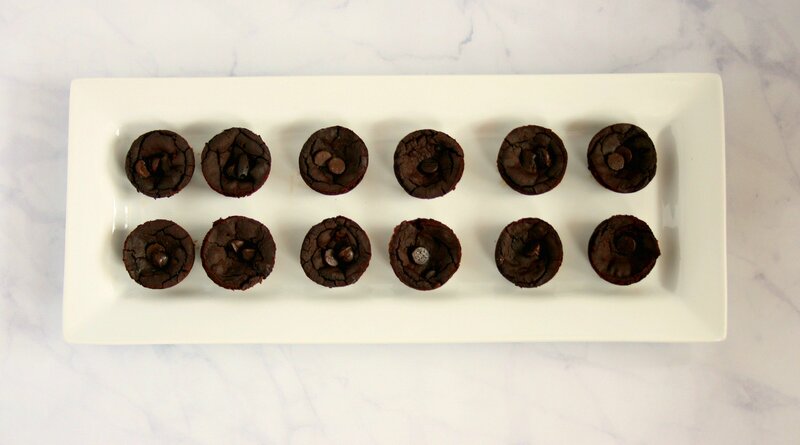 In honor of their 6th birthday ( and my birthday :)) , we’re celebrating with cake…or in my case black bean brownie bites. I just love brownie bites! I could eat like 20 of them because they’re so little. That’s why I had to create something with more nutritional value. These black bean brownie bites turned out SO GOOD. You can’t even tell they are made with black beans. I love baking with beans for the protein, vitamins, minerals, and fiber punch. I made a couple more health twist to these brownies. I reduced the amount of sugar needed by adding apple sauce. This made the brownies sweet and fudgey. I also used flax eggs in place off eggs. To be perfectly honest, this was a complete accident. I forgot to grab eggs at the grocery store and had to improvise. Have you used flax eggs? I never had so I was pleasantly surprised that they worked! Flax seed eggs are made out of flax seed meal and water. Let it sit for 5 minutes to thicken. It will get thick and sticky- similar to an egg. I was very impressed! Whether you’re craving something sweet or baking for a party, these black bean brownie bites are definitely a crowd pleaser. Looking for a treat to satisfy your sweet tooth? Don't let their small size fool you! These rich and gooey black bean brownie bites are filled with flavor and nutrition. Good things do come in small packages! Make flax seed egg by combining flax seed meal and water in a small bowl. Let sit for 5 minutes to thicken. Place black beans in a food processor or high power blender. Blend to a paste. Add wet ingredients and blend. Make sure to scrape batter off the side of the processor. Add dry ingredients (not the chocolate chips) and continue to blend. Batter should be thick and smooth. Fold in chocolate chips with a spatula. Spray mini muffin pan with nonstick cooking spray. Place one Tbsp of brownie batter into the mini muffin tins. Bake for 25-30 minutes or until a toothpick comes out almost clean. Be careful not to over bake. These tasty little bites look light they melt in your mouth! Yum! Such a dark, fudgey color! Love that they have coffee too!